While high-precision and feature-laden power tools are often our first choice for use in lutherie, there are times when a gentler, hands-on approach is called for, and we reach for the handplane or chisels to finely shape our creations. As we all know, the blades of these carving and cutting tools will from time to time require some TLC to ensure that they always remain in peak condition, and a honing guide can help achieve this goal. I will readily admit that I am rubbish at freehand sharpening chisels and plane blades. Keeping the blade at a consistent angle to the stone while introducing a steady, alternating honing motion is something I've always struggled to master. Most of the time I either find myself accidentally honing the blade slightly skewed or deviating from the intended 30 degree bevel, resulting in a tool too blunt to scare any self-respecting piece of timber, let alone shave hairs off the back of my arm. So it was somewhat of a relief when I finally admitted defeat and went and bought my first honing guide to help me get my chisel sharpening back on track. For those that aren't familiar, a honing guide is a device fitted with a roller assembly that secures a chisel or plane iron in a set of jaws and allows the user to sharpen the blade on a whetstone, diamond stone or any other flat surface coated with abrasive material to achieve a consistent cutting bevel every time. An accurate and clean bevel on a chisel or plane iron is key to getting the best performance out of those tools. My first honing guide was a simple affair, featuring a clamping mechanism made up of two wide plates with a brass roller underneath. The clamping plate had a series of straight lines etched into the surface to assist with visually aligning the fitted blade so that it sat square in the clamp, and the blade was secured by tightening two thumbscrews at either side. Generally it worked quite OK for the paltry $20 I paid for it at the time, but it wasn't without its drawbacks. The clamping mechanism was made from aluminium which had a tendency to flex when the thumbscrews were tightened, which allowed narrower blades to gradually skew to one side while honing. The clamping mechanism wouldn't hold shorter blades, such as spokeshave irons at the correct angle to the stone. Aligning a blade squarely against the refence marks on the guide was only as good as your eye. And there was no inherent way to accurately set and measure the bevel angle. Enter the MK II Honing Guide made by Canadian outfit Veritas, whose long list of premium-quality tools and accessories have been high on many woodworkers' must-have lists. With a street price of around $68US, this could arguably be described as the Rolls Royce of honing guides. Straight off the shelf the Standard Mk II comes with a solid diecast zinc alloy blade clamping body with a wide brass roller, an angle setting registration jig which is also used to set the squareness of the blade being held and a set of clearly-written instructions. The standard honing guide set can also be upgraded with additional accessories that include a cambered brass roller for honing blades into a gentle curve (useful for wide plane irons) and a set of narrow tool jaws for securely holding chisels as slim as 1/8". The guide will happily accept plane irons as wide as 2 7/8" (73mm), which should easily accommodate the larger Number 7 jointer planes and beyond, and up to 15/32" (12mm) thick. Minimum recommended blade capacity is quoted as 1/2" wide, The brass roller underneath has an eccentric axle which can be rotated on a series of fixed steps, adjusting the angle of the guide by 1-2 degrees for adding a micro-bevel to the tool being sharpened. The included angle registration jig slides on to an integral dovetail on the front of the guide and includes a series of holes for positioning a sliding stop. In practice the user fits the angle registration jig to the front of the honing guide and tightens the small brass thumbscrew to hold it securely. Where the back edge of the registration jig meets the honing guide there are a series of notches which correspond to the width of the blade being sharpened which are used to ensure that the blade will be positioned exactly in the middle of the honing guide. The registration jig is clearly marked with multiple angles, and Veritas handily include a chart in the instructions giving suggested honing angles for various tools based on their intended usage. The coloured group of angles are used in conjunction with a secondary locking screw on the honing guides' body, which raises and lowers the height of the brass roller. The red high angle setting is useful for traditional wooden soled planes and spokeshaves, where the blade is typically held at a steep angle to the workpiece, whereas the yellow range is for more common mortising chisels and plane irons. The green range is included primarily for the purpose of adding a back bevel to a blade, which can be useful in certain situations where a plane iron needs its effective cutting bevel angle increased to deal with highly figured grain. 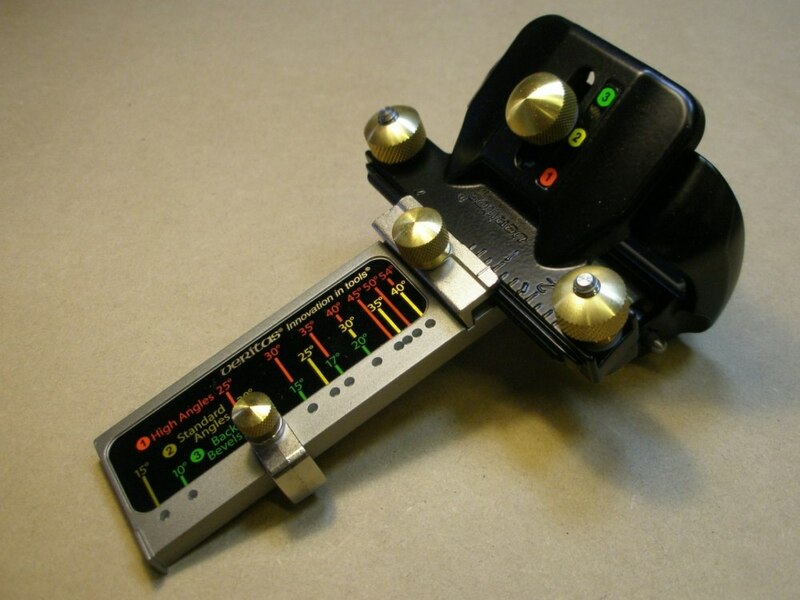 In practice however there is a large degree of overlap in the angle settings between ranges and there's no reason why a particular angle range needs to be chosen over another when honing, unless the blade is particularly short and cannot be honed at a low bevel while on a high range setting. While using the guide I found it easier to select the angle I wanted at a given range while still allowing enough of the blade to project through the jaws. The sliding stop on the registration jig is positioned at the desired angle the tool is to be honed at and secured in place. The chisel or plane iron is then inserted into the jaws of the honing guide and slid forward until the tip just rests on the stop. With the tool in place the thumbscrews on the jaws can be tightened, the angle registration jig slid off to one side and the blade is ready to begin being honed. The shape of the honing guide is also more ergonomic than my old flat-plated honing guide, in that the thumbs can be more comfortably potisioned underneath the chisel without having to wrap around the clamping mechanism, which is far less fatiguing. After about 15 minutes work at various abrasive grits the primary bevel is complete. At this point the chisel can be stropped/polished to remove the last of the burr that has been created during honing process and used straight away. But the Mk II has one more trick up its sleeve. With the blade still held in place, the eccentric axle on the brass roller can be rotated around to increase the angle of the honing guide by 1-2 degrees and a micro-bevel can be honed into the blade to further refine the cutting ability. Of course, no test of a chisel's sharpness is complete without putting it to use. In this case my rubbish old Stanley 1" chisel is being put to work on the end grain of some Tasmanian Blackwood, a timber that can be notorious for its hard and easy-to-splinter nature. Shearing clean, sub-micron thickness shavings was no trouble whatsoever. Due to the shape of the jaws and low height of the guide, shorter blades are also easy to accommodate. This 2" spokeshave blade can be fitted into the guide and almost any bevel can be consistently honed onto the blade without resorting to guesswork or clumsy attachments. Veritas Mk II Honing Guide by curtisa is licensed under a Creative Commons Attribution-NonCommercial-ShareAlike 4.0 International License.